My name is Derek Leavell. I am one of Blue Boutique’s professional body piercers in the West Valley Utah location. I have been piercing professionally sense 2007. I am committed to preforming fast, accurate, safe, professional piercing in a clean aseptic environment. Today, I’m blogging about the SEPTUM piercing. Also known as the bull ring. 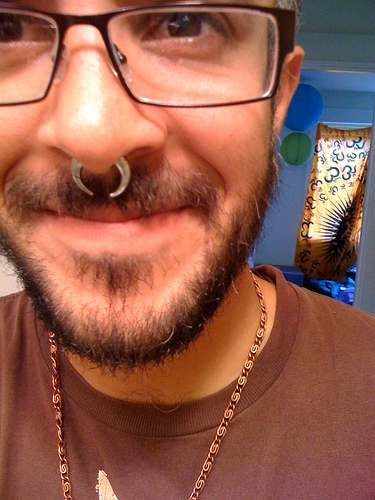 The piercing of the septum is probably the second most common piercing among primitive people after ear piercing, its even more common than nostril piercing. Its probably so popular for the same reasons as the nose piercing, with added attraction that the piercing can be stretched and large pieces of jewelry can be inserted, I.E. pig’s tusks, pieces of bone, feathers, pieces of wood, ect.The jewelry most commonly worn in the SEPTUM is called a “circular barbell” or “septum retainer” that way the jewelry can be tucked up in the nasal cavity to hide from the bosses. However you can also use a ring and the ring usually worn in the SEPTUM is called a “captive bead ring.” the balls of the circular barbell as well as the captive bead rings come in tons of shapes and colors as well as different gems you can put in them. Usually for young females that choose to get their SEPTUM pierced they would go with a gem and a smaller size to look cute on their face as for guys would usually go for a ball or a spike and a larger gauge to stand out more. All jewelry inserted in a healing piercing should be made out of either 316-LVM ASTM f-138 implant grade Surgical Stainless Steel or ASTM F-136 6AI-4V ELI Titanium. Jewelry should be “internally threaded”. This means the end ball threads into the post. Never be pierced with “externally threaded” jewelry. This type of jewelry is cheap. Jewelry not made of surgical stainless steel and can cause micro tears in the tissue that can harbor bacteria that may lead to a infection.The septum piercing is particularly prevalent among warrior cultures, this probably has to do with the fact that large tusks through the septum give the face a fierce appearance. The use of septum tusks is very prevalent in Irian Jaya, New Guinea and the Solomon Islands, pig’s tusks being the most popular. Among the Asmat tribe of Irian Jaya the most prestigious septum tusk is the “Otsj” this is a large bone plug, which can be as thick as 25mm. They are usually made of the leg bones of a pig, but occasionally they are made from the Tibia bone of an enemy slain in battle. The Septum piercing was beloved by the Aztecs, the Mayans, and the Incas. They wore a variety of jewellery, but jade and gold were the most popular because of their religous associations. The modern day Cuna Indians of Panama continue this practice by wearing thick pure gold rings in their septum. The piercing is also popular in India, Nepal, and Tibet, a pendant “Bulak” is worn, and some examples are so large as to prevent the person being able to eat, the jewelry has to be lifted up during meals. In Rajasthan in Himachal Pradesh these Bulak are particularly elaborate, and extremely large. Septum piercing was widely practised by many North American Indian tribes, the name of the Nez Perc, tribe of Washington state, stem from their practice of piercing the septum, Nez Perc, is French for Nose Pierced, and was given to the tribe by the French fur traders. Australian aboriginals pierced the septum and passed a long stick or bone through the piercing to flatten the nose, they believed a flat nose to be the most desirable. Among the Bundi tribe of the Bismarck Ranges of Papua New Guinea the piercing is performed using the thin end of the Sweet Potato plant (Ogai Iriva), usually at age 18-22. The age at which the piercing is done varies greatly between different tribes, some tribes perform the rite at age 9-10.In the last couple of decades, body piercing of all types has become extremely popular all over the world and mainly in the west. The Septum piercing is done through the small ridge of skin just underneath the middle of the nose between the Alar cartilage (outer) and the Quadrangular cartilage (separating the nostrils). There is usually a small depression in this area towards the front of the nose, this is usually the best place for the piercing. Caring for your SEPTUM piercing is very easy but does take a degree of patience. The SEPTUM can take anywhere from a few weeks to a few months to be fully healed “every buddy’s body is different”. The piercing can be very tender for the first few weeks of healing process. Personal hygiene must be kept to a very high standard. Avoid touching your jewelry. And that goes for rotating your jewelry If you find it necessary to touch your piercing, make sure your hands are washed, cleaned and dried. To clean your septum piercing a simple warm saline soak 2 times a day or even a saline spray such as H2Ocean or Wound Wash Saline spray a couple times a day is recommended. Let your piercing relax and try not to move it. Elevating your head while you sleep for the first few nights will also help to keep the swelling down. Things to avoid during the healing process include: scented soaps and body washes, rubbing alcohol, ointments, peroxide. For a complete aftercare instructions feel free to stop by one of the Blue Boutiques and ask one of our highly trained, knowledgeable piercers! The septum is very easy and beautiful piercing that has transcended the entire body piercing world. Whether it is your first piercing or 50th the Blue Boutique has the largest selection of high quality body jewelry and highly skilled and experienced body piercers always on staff! Let us help you in making the right decision for your new piercing!